Los Angeles quartet Dear Boy are firm favourites in their hometown's indie scene, but their new EP suggests that they could go much further. Dear Boy is fronted by Ben Grey, formerly of indie darlings Scarlet Grey, with guitarist Austin Hayman, bassist Lucy Lawrence and drummer Keith Cooper completing the line-up. The band has been together since 2012 and they released their Parts of a Flower EP in 2016, and in that time they've garnered a dedicated fanbase and radio play on local stations. The distillation period between Parts of a Flower and The Strawberry EP has given the band a more confident and defined sound. Their long-awaited new EP takes the band's sound up a notch, and shows them at their most creative. 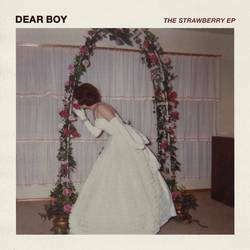 The Strawberry EP taps into the band's pop and shoegaze sensibilities, and captures the excitement of meeting someone who becomes a defining part of a particular period of your life, albeit fleetingly. The five-track EP comes to life with opener "Semester", a sweet, dream-like exploration of being infatuated with someone and longing for them even after they've gone ("I want you, and all of it/Oh you were my semester"), and sets the course for the polished sound of the rest of the EP. "Something Good" is an acoustic lamentation of everything going wrong, with Grey intoning: "Anything goes/I'm gone before anyone knows/To let you know that I need something good" as drums fills and distant, meandering guitar strains build to a tame crescendo, without detracting from the intimate sound of the track. This leads into the airy, radio-friendly pomp of "Anything at All", a song that wouldn't sound out of place on the soundtrack of a 90s American teenage romcom. It's an optimistic track that's led by Hayman's shoegaze-inspired guitar playing. Just at the point when it seems like the lovesick protagonist has gotten over the person who defined a specific period of his life, the EP comes full circle with closer "Love Interest". Filled with 80s pop influences and bolstered by an injection of 90s guitar, "Love Interest" sees Grey become infatuated again while recounting a collection of fantasies and hopes as he sings: "I could be better/All that you need". It manages to capture a rush of emotions that have been sung about countless time before, but in a new and fresh way. Dear Boy are open about their influences, spanning 90s Brit Pop, shoegaze and 80s post-punk, but they have developed their sound as a reference point to their influences instead of being constrained by them. The Strawberry EP shows the band's potential to reach a bigger audience than currently they do, and it shows them flexing their creative muscles. The EP manages to be emotive and earnest without being cloying, and looks back at past influences without imitating them - the way music should be. Posted March 18, 2019, 7:01 p.m.
Posted Jan. 22, 2016, 12:07 a.m.
Posted Sept. 2, 2013, 5:13 p.m.
Posted Dec. 10, 2016, 11:39 a.m.
Posted Jan. 26, 2016, 3:05 p.m.
Posted Aug. 10, 2015, 11:59 p.m.